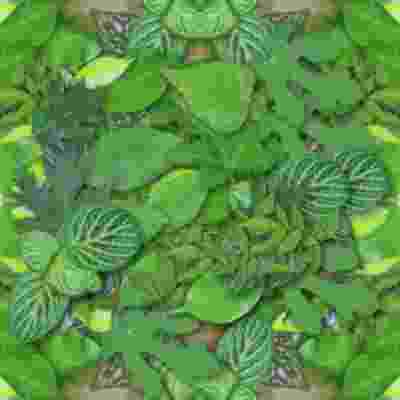 Supersaurus was a massive plant-eater (herbivore) that lived in the late Jurassic period and early Cretaceous period, between about 154 and 142 million years ago, in North America. Supersaurus was around 108 feet (33 meters) to 112 feet (34 meters) long, and probably weighed something in the region of 35 to 40 tons. While not nearly as heavy as Brachiosaurus, Supersaurus is one of the longest dinosaurs known. Supersaurus was discovered by Jim Jensen 1979. At the same time, he also discovered what he believed was a second even larger dinosaur, which he unofficially named "Ultrasaurus" (this name was used in some press coverage, but not used in a scientific publication). 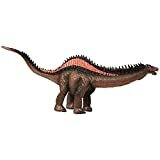 However, when Jensen published his official scientific description of this second larger dinosaur in 1985, he found that the name "Ultrasaurus", had been already used (and thus had priority) as the name of a different dinosaur discovered by Haang Mook Kim in Korea in 1983. 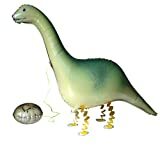 For a time then, Jensen's second dinosaur then became known as "Ultrasauros" (note an "o" instead of the final "u"). Later, however it was found that Ultrasauros was actually a mix of Supersaurus and Brachiosaurus bones. So, today, "Ultrasauros" is considered as a junior synonym for Supersaurus. North American Dinosaurs - Supersaurus lived in North America. Supersaurus was a genus of dinosaur. Although "Supersaurus" is the correct scientific name of this genus of dinosaur, the name "Ultrasauros" is also sometimes used. Supersaurus was a member of the Saurischia ("lizard-hipped") order of dinosaurs. What this means, is that although Supersaurus was not closely related to lizards, it did have similarly shaped pelvic bones. Supersaurus was a Sauropod - a member of a group of related large quadrupedal herbivorous (plant-eating) dinosaur with long necks. Supersaurus lived between about 154 million years ago and 142 million years ago, during the late Jurassic and early Cretaceous periods. Supersaurus lived in North America. Supersaurus was a herbivore (plant-eater). Supersaurus was about 108 (33 meters) to 112 feet (34 meters) long. Supersaurus weighed about 35 to 40 tons. In this captivating picture book with extraordinary illustrations, children will engage with the characters and love reading more than ever! Tyrant tyrannosaur T-Rex and his army of ninja Raptors are determined to take over the city one way or another. Only one thing can stop them The Supersaurs! When T-Rex kidnaps Doc, this team of crime fighting heroes need all their dinopowers to rescue himand save New Dino City! Let the unforgettable Supersaurus legend begin!! It's a fight of good over evil in down-town New Dino City. Follow the struggles of our band of fearless Dino Supersaurs in this cool coloring book as they pit their wits and test their superpowers against T-Rex and his fellow baddies. With comic strips to read and complete, hilarious dinosaur humour and things to count, spot and find on every action-packed coloring spread and a covermount flip book showing the action in Dino City, this book is sure to beat boredom into submission! 2000 all-action, Dino Supersaur stickers for hours of stickering fun! This book is packed with scenes to fill with stickers, as well as sticker-and-doodle pictures to complete and inventive puzzles and activities. Children will love using the cartoon sound effects and speech bubble stickers to complete the comic strips and make the superpowered dinosaur goodies and baddies burst into life. This activity book is perfect for any child that loves to use their imagination! With over 150 activity missions to complete, children will get creative and have endless amounts of fun! There are spaces to doodle, draw, color and decode each mega mission. Kids can sketch, doodle, scribble and scrawl their favourite Dino Supersaurs in this book of fast and furious creative fun. Packed with inspiration for dinosaur doodles, the humorous cartoons and sketchy art style will capture the imagination of budding doodlers - and there's plenty of blank space for children to fill with their own creations, too. 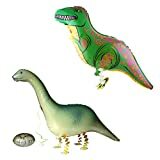 With over 1000 stickers to embellish pictures and two cool moveable parts dino erasers to rub out mistakes. Pam! T-Rex y sus malvados secuaces amenazan a new dino con su insoportable explosivo sonoro. Saca tus colores y ayuda a los supersaurios a derrotarlos! 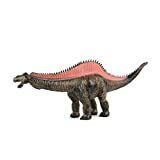 The lifelike dinosaur will be a great Gift idea. 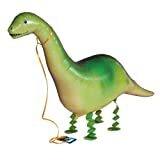 Size: 12.6"x4.7"
Be the cool kid on the block with your very own dinosaur pet! My own pet balloon is a helium inflatable air walker balloon with an attached ribbon. This perfect pet playmate is made with high-quality materials, welded seams and special inflation valves designed for long-lasting fun. Collect them all, and give the gift that keeps on giving smiles! Detailed artwork and design give these dinosaur balloons a fun, fantastic appearance. These big, colorful balloons are sure to attract attention from both children and adults alike. Perfect decor to birthday party, carnival, feast, and etc. The perfect assessories for any dinosaur-themed event! This Walking Animal Balloon come with automatically sealing glue, easy to inflatable and deflated. Please put the ball to pinch flat for easy storage after your party. They can be used again and again. Each Tattoo is Individually wrapped so adding these to goody bags is a snap.